Mostly in anticipation of Detroit: Become Human. Thought I’d eventually get around to playing Beyond: Two Souls while waiting. 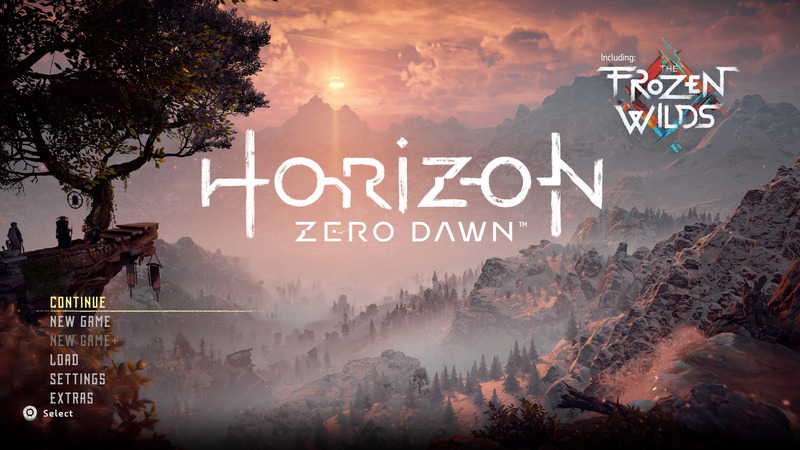 After racking up an entire wishlist to keep an eye out for, the only one on current sale in my country’s Playstation store was Horizon Zero Dawn. The screenshots don’t do it justice. This thing looks stunningly glorious on a big screen 4K TV. It even comes with a built in photo mode where you can play around with camera angles, change your protagonist’s stance and expression, alter the time of day, tinker with virtual depth of field, apertures and F-stops… all in search of that perfect shot. Why the hell don’t more games have this? Mind blown. 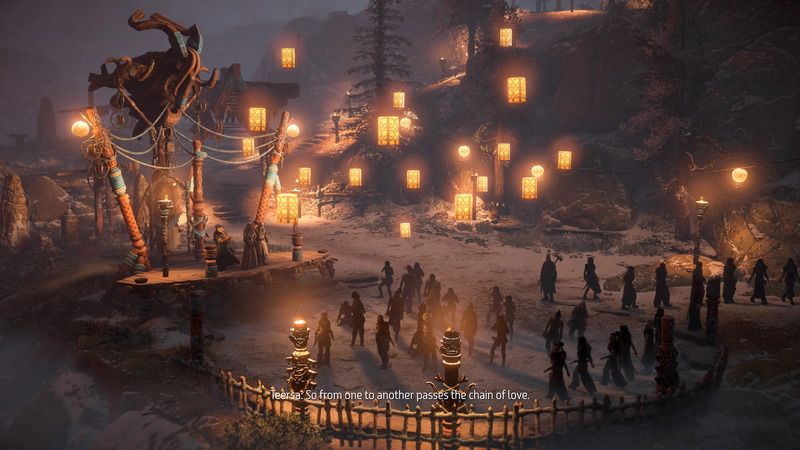 Cutscenes look great; the early story has been intriguing so far. 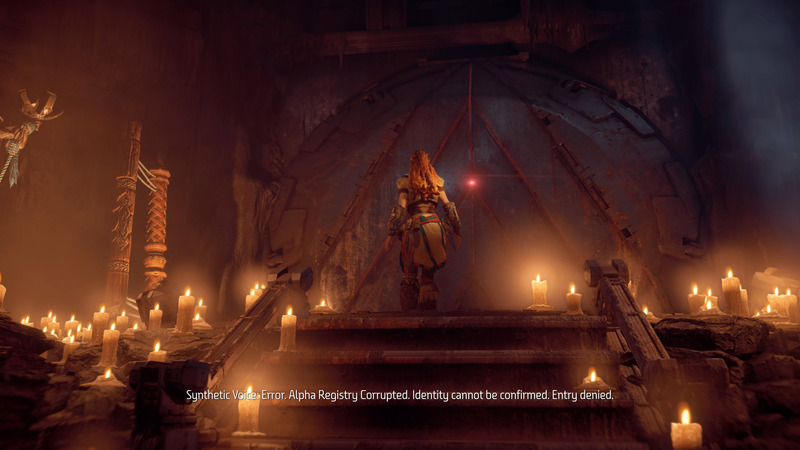 You play as Aloy, outcast as a child from a tribe known as the Nora. 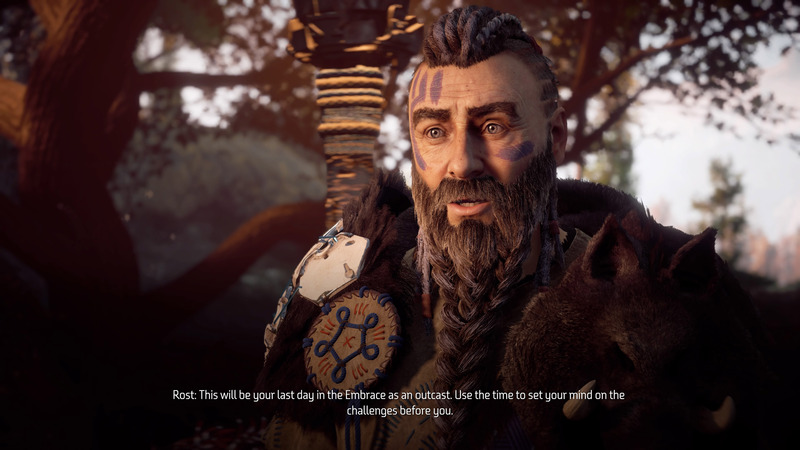 The prologue and tutorial gives you a little taste of the mystery surrounding your origins and lets you experience the relationship with your mentor/teacher/surrogate father Rost. Your early goals revolve around gaining acceptance with your tribe, by running a trial known as The Proving when you come of age. Before you know it, the plot moves along and you’re suddenly made aware there is a MUCH larger world beyond the one you knew. 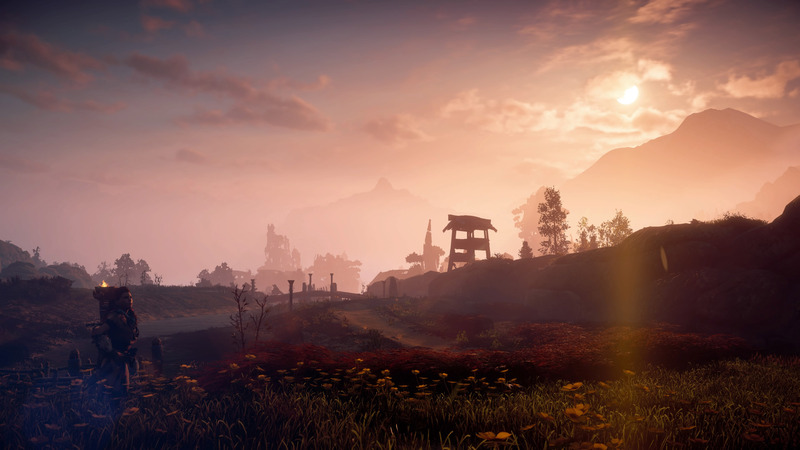 Cue end of learning/beginning tutorial period and the start of exploring what feels like a big open world full of mysteries and wonder. 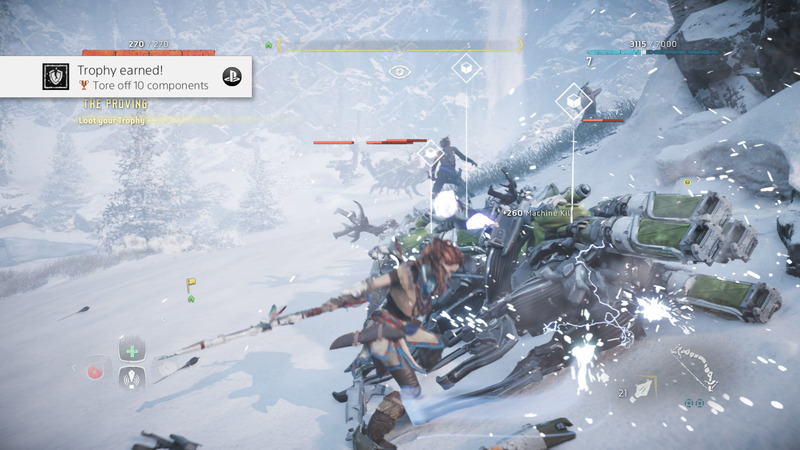 The brilliance of the Horizon Zero Dawn world is in the juxtaposition of the primitive tribal (almost dinosaur hunter like) protagonist/origins with beasts to hunt that are machines and reminiscent of a Transformers movie – complex almost-sentient robots that act like animals… and even scarier monsters. Right away, this situates you not in the dawn of prehistory, but a post-apocalyptic period that personally gives me Numenera-like vibes. Somehow, societies have regressed to a pre-technology period, where they hunt (and are hunted by) autonomous robots. They salvage them for metal parts, which are used in ways distinctly not intended by their original creators, such as in shiny tribal decorations or as components in simple weapons and traps. 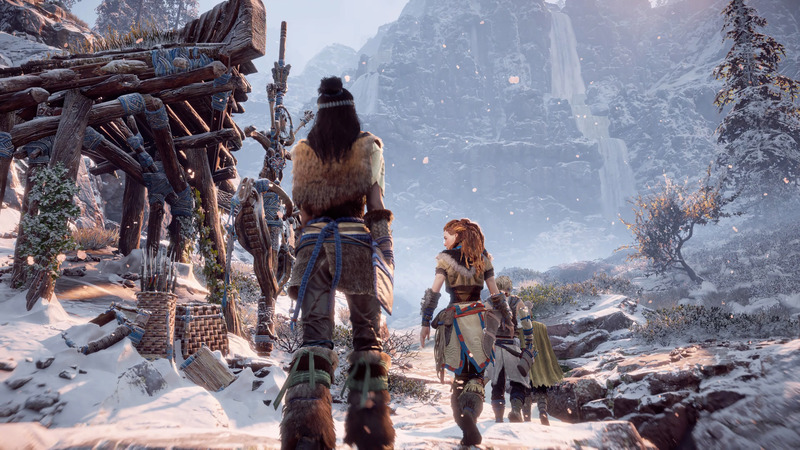 Aloy, the protagonist you control, is naturally just a little different, a little more touched and rebellious enough to go against the “common sense” of the time and delve deeper into the archaeological ruins of a more modern age in search of secrets. She doesn’t really understand what she sees at first, but from a more meta angle, the player guiding her does. It’s this heady mix that proves immensely compelling. You want to know what happened to the world. What it looks like now. How it was before. Who else is in the world. 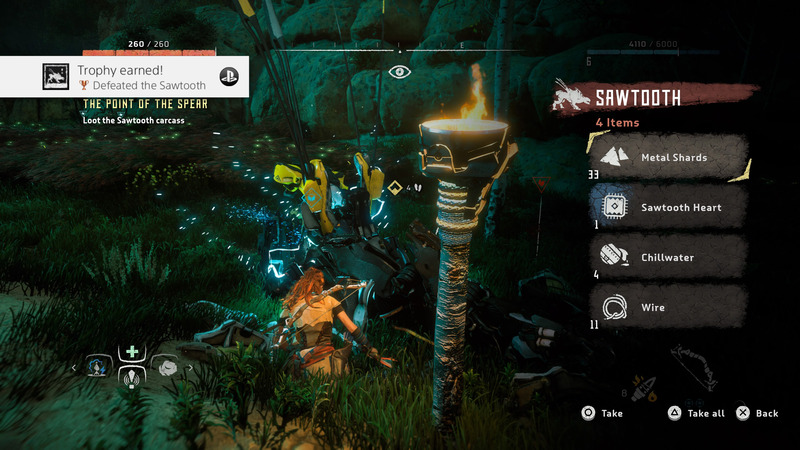 Who Aloy really is. On and on, questions arise that can only be answered by playing on and seeing for yourself.